This increasing rate of change requires finance departments to become agile organizations. Sudden or complex changes can significantly affect processes or systems effectiveness and require a substantively new approach. Furthermore, organizations need to have a continuous process to deal with the impact of continuous change. Our Financial Effectiveness Framework has been developed to address the three key components necessary to be financially effective within the finance organization. People are a unique and very important asset, which leave every day and choose whether to return. An organization needs to effectively manage its critical processes despite changes or the loss of personnel. If a 100 person production line were to lose one or more team members, it would probably not impact production. Of course the organization lost 20 or 30 members, then this would be more serious. So what does it take to create a proactive team? We believe that effective training creates an environment whereby the people band together to create a team which can self-heal in the face of adverse changes. In order to develop these teams, management must provide training which develops trust, good habits, leadership, teamwork, effective communication, responsibility and cross training. Once created, the team will develop the skills necessary to grow and be able to face the challenges of change. Most finance organizations document their processes in narrative documents used primarily for compliance purposes. Keeping this process document current takes time and effort, which is generally in short supply in today’s fast changing environment. Our experience shows that about a third of these processes are not documented, but are retained in institutional memory, which leaves the building each night. We are reminded of the story of a very technical process for calculating deferred fuel costs of a publicly traded public utility company, which was prepared by a long time employee who did not carefully document the process, not cross-train anyone on the process. Two weeks before the year end, the employee passed away. Needless to say, many late nights, lots of stress and extra cost were incurred to close the books that fiscal year. 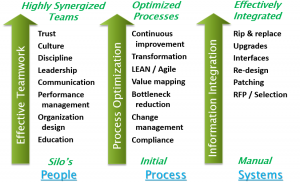 How does an organization create optimized processes? Information Systems are the workhorses of the finance organization. They have been developed to process enormous amounts of data according to the programming rules associated with the system. The promise of a single system has faded and most organizations have serial implementations of a myriad of systems which need to work together to create periodic financial statements and provide timely and accurate data to allow management to effectively run the organization. Systems implementation are costly, require a significant effort and generally rely on outside consultants since the core finance and IT teams are busy with their daily work. Sometimes the implemented system fails to meet the promise of the solution, resulting in manual steps to close the books. We notice that it is always those edge cases, those transactions which do not meet the rules of the system which cause the most rework and errors. The emergence of XBRL for United States Public Reporting Companies has thrown yet another layer of software and compliance requirements. We approach systems in a holistic manner looking at the organization’s requirements, the features of existing software, the interaction between users and the importance of the system to closing the books. We also consider the various alternatives such as patching, re-design, use of interfaces, upgrading the system or replacing the system. A mid-term and long-term strategy is important as the organization builds out its information systems environment. To create a world class finance organization, you need to address all three areas. Schedule a call with an SVA director today to find out how we can help you to achieve these results.